PG&E has smart meters, grid automation, solar challenges, storage mandates—and software to make sense of it all. Pacific Gas & Electric has one of the country’s most aggressive smart grid plans -- and, with the challenges it’s facing on the edges of its grid, it had better. The Northern California utility has more customer-owned rooftop solar PV systems on its grid than any U.S. utility, and it’s expecting to be one of the biggest supporters of customer-owned plug-in electric vehicles when (or if) that market takes off. It’s also in a state that’s leading the nation in renewable energy integration mandates, which means lots of intermittent wind and solar power that’s hard to handle using traditional grid tools. Add to that a statewide grid energy storage mandate that could see an unprecedented number of battery systems being installed over the coming years, and we’re talking a lot of new technology to integrate. PG&E just released its 2013 smart grid annual report (PDF), which lays out a set of state-mandated metrics on its progress toward its many goals. In the meantime, PG&E executives and researchers showed off the work underway on current and future challenges during a tour of the utility’s San Ramon Technology Center last week, providing a useful window into how this utility is pushing the envelope on putting all these pieces together. Let’s start with PG&E’s advanced metering infrastructure (AMI), which includes networked natural gas meters from Aclara and electricity meters from Landis+Gyr and General Electric (GE) networked by Silver Spring Networks (SSNI). That $2.2 billion project is now in the final stages of rolling out nearly 10 million smart electric and gas meters to its customers. PG&E has had its share of missteps along the way, particularly in integrating those meters into operations from outage management to customer service. The good news is that its AMI networks are now running well, with interval data collection rates reaching 99.92 percent for Silver Spring’s electric meters and 99.66 percent for Aclara’s gas meters, Kevin Dasso, PG&E’s director of technology and information strategy, pointed out during last week’s San Ramon facility tour. In the meantime, PG&E is expanding its smart meter uses beyond customer billing, with one of its first functions centered on outage management. Since late 2011, the utility has been getting “last-gasp” notices from meters that lose power, and then “pinging” them to find out when power is restored. That’s important, because right now, the only way utilities know whether the power is back on is phone calls from individual customers. So far, PG&E credits its AMI outage integration with helping it avoid about 6,000 “truck rolls,” or outage crew dispatches, from July 2012 through June 2013. But what if customers aren’t at home or at work or are sleeping when the power goes out? 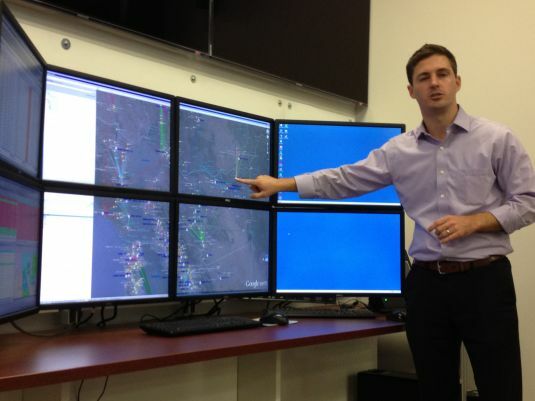 Ryan Hanley, manager of technology and integration, showed off a digital map last week at PG&E’s distribution operations test lab, on which the number of red dots, representing customer outage calls, was far outweighed by blue dots, representing meters that had reported themselves as lacking power. After a year or so of work, PG&E is confident that it’s separating false meter outage reports from real ones, allowing outage restoration crews to roll without customer corroboration, he said. That can help both in fixing everyday outages faster, before customers start complaining, or during emergencies, when call centers and utility crews are being flooded with work and need additional data to prioritize it. One of the key benefits of smart meters is to connect individual customers to their energy usage information. That can come from utility back-office systems via web pages or mailed reports, or from the ZigBee radios inside smart meters via a home area network (HAN). On the back-end side, PG&E has had its web portals up and running since 2011, and so far nearly 1.6 million customers, or 31 percent of the total, have used it at least once in the past twelve months. But only 81,000, or about 2 percent, have used it to enroll in a PG&E energy information program -- a low figure that's fairly standard for utility customer opt-in programs, but still far from ideal. And that’s a lot compared to how many customers are getting energy data directly from their smart meter HANs. PG&E has been piloting home-to-meter connectivity for some time, and last year joined California’s other big investor-owned utilities to allow customer-purchased devices to connect to its ZigBee smart meter networks. But as of mid-year, only 364 customers had registered such third-party devices with PG&E, according to its 2013 report. Even so, PG&E is mandated to increase its capacity for HAN connectivity to manage 25,000 customers this year and 200,000 by next year, Arthur Anderson, who leads the Emerging Technology Laboratory at the San Ramon facility, said last week. That’s because PG&E wants to expand the HAN to cover all kinds of different devices and programs, Dasso said. That includes using the HAN to connect the 160,000 customers signed up for PG&E’s air-conditioning-based direct load control program, he said. That old-school form of demand response, which sends out one-way radio signals to turn AC compressors off to reduce peak loads, doesn’t provide the utility any feedback, something that the two-way smart meter network could help provide. Nor have these one-way direct control programs proven particularly popular with the public. That’s pushing more utilities like PG&E to offer pricing programs that incentivize peak load reduction in more customer-friendly ways -- and while they're not smart-meter-enabled and HAN-enabled right now, they’re meant to be in the future. For example, PG&E has more than 120,000 customers in its SmartRate critical peak pricing program, which now sends customers day-ahead warnings via phone and email alerts -- though PG&E is spending $12 million to pilot a version that sends messages through its smart meter HAN networks. Another 872,000 customers are receiving home energy reports from Opower, which has also launched a pilot with Honeywell to bring connected smart thermostats to a small group of PG&E test customers. Another future use of smart meters and HANs is to connect to PG&E’s growing roster of solar-equipped customers. As of June 30, PG&E had 88,947 customer-owned or -operated solar systems connected to its grid, with a combined generation capacity of 978.7 megawatts. That’s nearly as much power as one big coal-fired or nuclear power plant produces, but spread out across the edges of the distribution grid -- and for the most part, PG&E has no way to know how much power those PV systems are generating at any given time. Smart meters could help with that, Dasso said. One method is to use smart meters to measure solar’s net impact on whole-home energy usage through the course of the day, as PG&E does to calculate the net metering benefits it’s required to pay solar-equipped customers. Solar systems can also be individually metered, as is the case with larger-scale projects. Beyond that, PG&E and its fellow California investor-owned utilities are looking toward the state’s Electric Program Investment Charge (EPIC) program, which allocates $162 million to projects between now and 2020. PG&E is seeking approval from the California Public Utilities Commission for a project aimed at solar inverters, to “allow [the utility] to look at ways we could communicate with those inverters more directly,” he said -- a task that could help manage the problems that distributed PV systems can cause for grid stability. Another San Ramon laboratory is already busy testing solar inverters’ effects on the grid when it comes to unintentional islanding. That’s a term for what happens when isolated sections of the distribution grid are disconnected from grid power, but remain energized by all the solar systems on them. While IEEE 1547 standards require grid-connected inverters to disconnect when grid power goes down, “1547 does not address the whole system performance,” Dasso said. In other words, on parts of the grid with significant amounts of solar generation, each individual inverter may not sense the loss of grid power, since they’re all powering one another, so to speak. That could be a good thing, if that section of the grid is designed to operate as a microgrid -- but when it’s unintended, it can cause damage to grid systems and loads like electric motors, as well as presenting a danger to utility workers and the public. Batteries and other forms of distributed energy storage could help stabilize solar power that’s integrated with the grid, though customer-owned storage systems can also create complications for utilities. But with the CPUC set to mandate the state’s utilities to add a collective 1.3 gigawatts of energy storage to their grids by 2020, PG&E is under the gun to learn the ins and outs of grid storage integration. 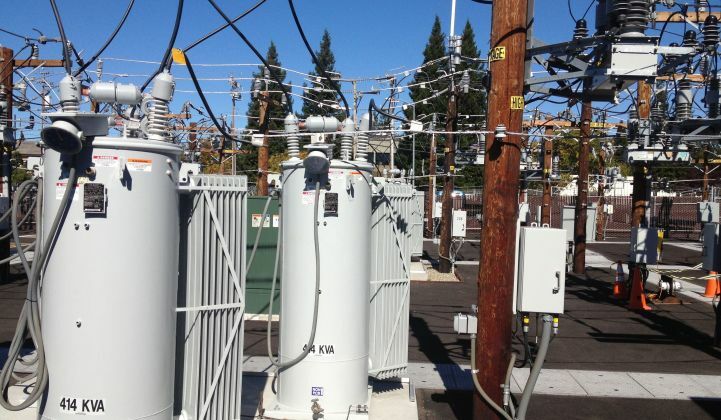 PG&E already has two large-scale sodium-sulfur battery projects up and running in Vacaville and San Jose, but it’s also preparing for more distributed batteries, including those owned and operated by third parties. 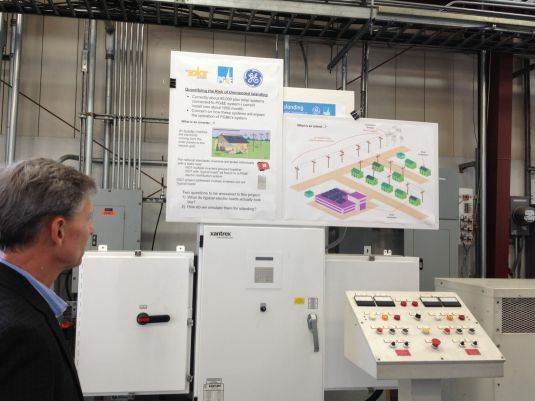 To prepare, it’s testing a range of battery and inverter combinations at its San Ramon facility to see how they can be expected to perform under a range of environmental and operating conditions, Dasso said. Someday, plug-in electric vehicles might help play a role in grid balancing as well -- if the utility can find them. PG&E has a few small-scale pilot programs underway to test “smart charging” and demand response with plug-in cars. At the same time, there are only 4,258 customers enrolled in the utility's electric vehicle rate programs, which suggests that many plug-in owners in its service territory who don’t report when they buy a new EV may be missing out. That’s something that California utilities are soon hoping to remedy via a state law that allows the DMV to share its data as long as customers’ privacy is protected. Eventually, PG&E wants to connect its AMI network into its broader distribution grid operations, which are in the process of being consolidated from thirteen separate locations into three new Distribution System Operations Centers. 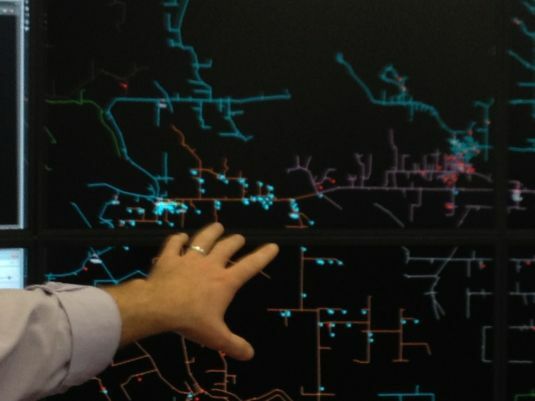 As part of this consolidation, PG&E is taking on the task of converting a disparate set of operations software, along with old-fashioned wall maps with colored stick-pins indicating outage locations, into an integrated system. That’s a huge task, incorporating everything from grid asset data, digital distribution grid models and geographic information system (GIS) maps that put disparate grid information into a single view, to weather forecasts, utility workforce management and coordinated communications systems that let PG&E work with local and state emergency responders during storms and other power emergencies. While PG&E is building this system up from vendor software tools such as Esri’s GIS, asset management from SAP and a distribution management system (DMS) from ABB’s Ventyx, “We will never get one vendor to do everything we want to do,” Hanley said. That’s particularly true when what a utility wants to do crosses utility software’s traditional boundaries. Although we’re seeing more grid vendors incorporate multipurpose capabilities into their platforms, much of the work remains in the hands of big utilities trying it all out for the first time. The task gets even more complicated when PG&E’s distribution automation (DA) work comes into the picture. PG&E has equipped 380 circuits with fault location, isolation and service restoration (FLISR) systems that have saved nearly 3.8 million customer outage minutes since they were installed, by rerouting power to minimize the number of customers affected. That’s part of the utility’s $360 million Cornerstone Improvement Program, and PG&E is going back to the California Public Utilities Commission (CPUC) to ask for more money in its 2013 general rate case to expand that work. Earlier this year, PG&E got a long-awaited CPUC approval to start the next phases of its DA work, a set of four pilot projects that will spend a combined $80 million over the coming years. Those include $16.78 million to install line sensors on about 30 distribution circuits to help pinpoint locations of outages; another $12.9 million for a “detect-and-locate” pilot that uses smart meters and existing grid gear for similar tasks on fifteen distribution circuits; and $38.5 million for a voltage and reactive power (volt/VAR) project to balance voltages on up to twelve distribution feeders for efficiency and better integration of distributed energy resources. All of these systems will need to be integrated into the bigger distribution grid picture, if they’re to serve the needs of PG&E’s scattered challenges to the century-old paradigm of centralized grid control.